Image courtesy of Library of Congress An unpopular President, John Adams faced increased scrutiny over the signing of the Sedition Act. In one of the first tests of freedom of speech, the House passed the Sedition Act, permitting the deportation, fine, or imprisonment of anyone deemed a threat or publishing “false, scandalous, or malicious writing” against the government of the United States. The 5th Congress (1797–1799), narrowly divided between the majority Federalists and minority Jeffersonian Republicans, voted 44 to 41 in favor of the Senate-passed bill. Federalists championed the legislation fearing impending war with France and out of the desire to hold the majority in Congress and to retain the White House, then occupied by Federalist John Adams. In an era when newspapers served as political parties' chief organs, the Republican press was particularly vicious in its attacks on Federalists and the Adams administration. 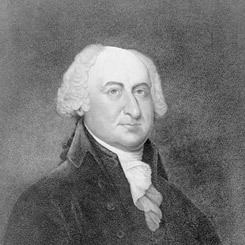 “Liberty of the press and of opinion is calculated to destroy all confidence between man and man,” noted one of the bill’s supporters, John Allen of Connecticut. “It leads to the dissolution of every bond of union.” Republicans defended the First Amendment protecting free speech and press. “What will be the situation of the people?” James Madison of Virginia demanded. “Not free: because they will be compelled to make their election between competitors whose pretensions they are not permitted by act equally to examine, to discuss and to ascertain.” Signed into law by Adams on July 14, the law proved immensely unpopular with the public and the President lost re-election to Thomas Jefferson in 1800. Under the incoming Republican administration, the Sedition Act eventually expired on March 3, 1801; however, arguments made for and against it shaped subsequent debate about constitutional protections of free speech.